There are string synths. And then there are sample libraries of orchestras. 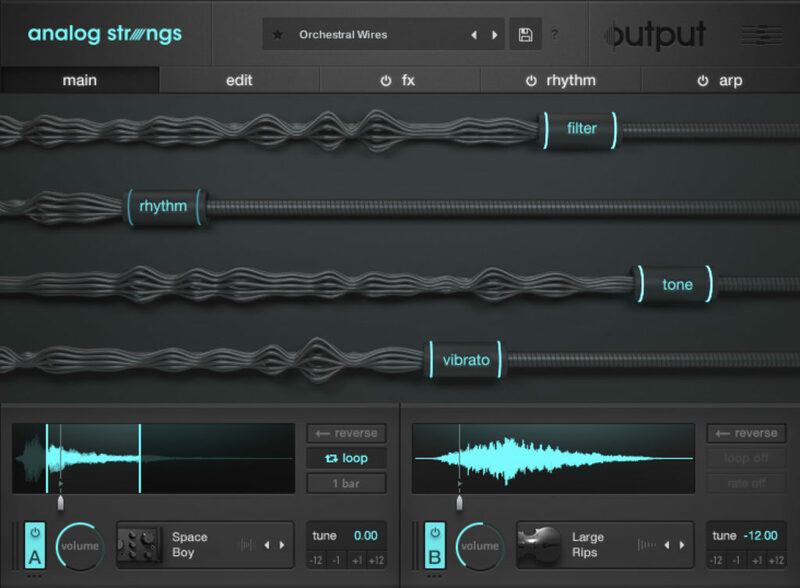 The strings synths produce sounds that are recognizably vintage, and more or less unrelated to actual orchestras. The sample libraries can get into obsessive compulsive detail and sound like an orchestra. But either way, we’ve been there before. There are great string synths around, but they tend a certain direction. And sampled orchestra libraries, while great, give you that feeling that what you’ve really done is to skimp the musicians of the Bratislava Radio Orchestra on a gig (and your feeling of being in the room with a full orchestra playing your own compositions). Now, Output has had a scary knack for finding the zeitgeist of contemporary sound design and delivering it as a package. And with each new release, they’ve gotten a bit better at that – building on the set of tools in the last one. Well, Analog Strings does look different. It’s an integrated instrument, but it’s also like having a huge toolbox of sound design tricks, samples, processors, and more. It’s a “things related to strings” toolkit. So there are solo samples, ensemble samples, big groupings, small groupings, weird sounds, conventional sounds. There are acoustic ensembles, vintage synthesizers, and sometimes unusual hybrids and oddball sources, too. 39 GB of sample content is included. And then there are additional tools: arpeggiators, sequencers, dual tape loopers, and a bunch of modulation. Output has their usual array of “movement” and effects like phaser/delay, all of which you can sequence and (if desired) sync. So the idea is, you then bind all those samples together, add reverse effects and looping, glue it all together, and then out comes something new. Think of it this way – a lot of the stuff in your pantry (sugar, flour, eggs) is pretty ordinary. But it’s capable of essentially unlimited combinations, thanks to some additional flavors, chemistry, and tools. Output is as always on it, as far as I’m concerned. Right now, production can’t just ape old sounds and expect to stand out. But that doesn’t mean necessarily you should become totally unrecognizable, either. So whether it’s film scores or EDM, experimental music or techno, I think you could convincingly apply this tool set and produce stuff that sounds like new hybrids. There are probably better options if you just want conventional sounds. But if you want to warp those sounds a little or a lot, this looks tough to beat. Also, while they do have presets handy (500 of them), I like that their building block approach makes it fairly easy to construct your own stuff from scratch. But forget that, first I have to go download it and get going. I’m going to be busy in the studio this spring.